Every now and then when I look at my boys, I have one of those moments. My heart aches, my eyes gather pools and there is a thick sadness in my throat. They are growing fast. The oldest only has two more years at home and that thought panics me. I feel like I want them to live with me forever. Down the street, there is an empty nest. My friend there is still working to cover college expenses but there are no stinky socks to pick up and no extra mouths around the dinner table. “Aren’t you terribly lonely?” I ask. “No,” she replies confidently and then goes on to explain how ready she was for her children to strike out on their own paths. Nature is a remarkable conductor. Adolescence comes on in order to challenge those very things that have been the foundation for the home. This must occur in order for teens to become adults. Just as a three year old waivers continuously between yes and no in order to learn decision making, the adolescent takes issue with the parents and the lifestyle that they’ve grown up in. It’s what caused my friend to be ready for her children to venture onward. Yet, she admits, she can hardly wait for college holidays when they are home – opening soda cans, staying up late and playing loud music. I felt a bit the same way this week when I opened my CSA bag. 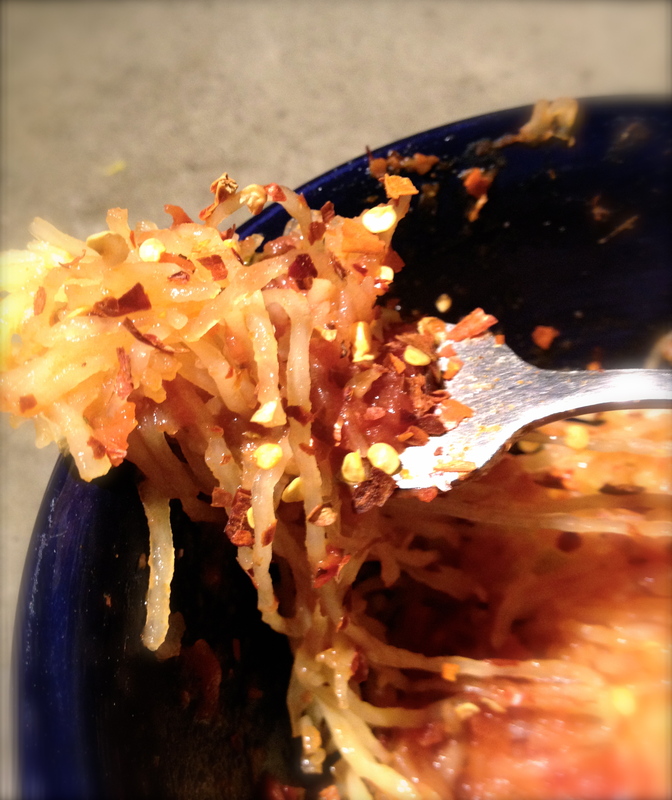 Ah, spaghetti squash – you are home again. Yes, I recall at the end of last season that I couldn’t wait to be done with you. Yet here I sat, holding your smooth firm yellow self and instantly began dreaming up ways to put you on my plate. That’s the issue with eating seasonally. We greet what is new and enjoy and explore and then when it comes on like a rush of teenage rap music, we work through it and can’t wait for it to be done. 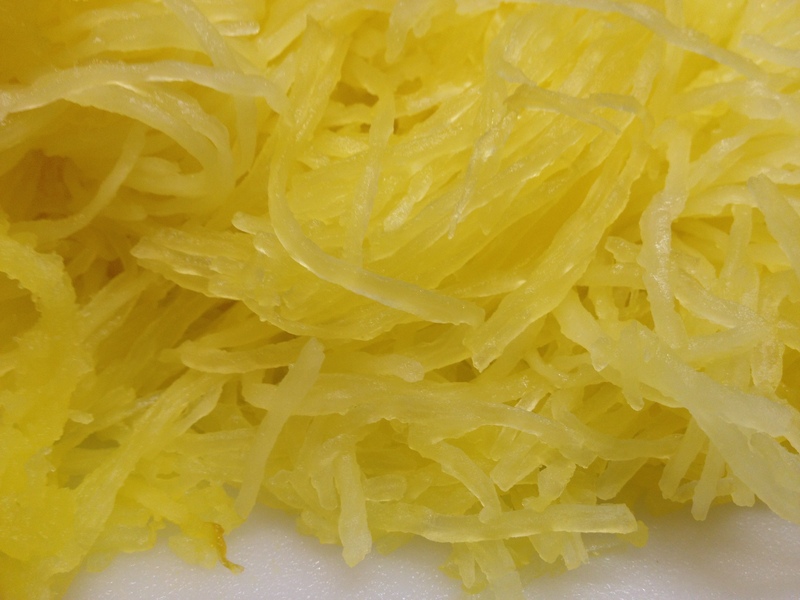 Spaghetti squash is a terrific way to lighten up your summer menu. It has a little bit of a lot of different nutrients and is very low in calories. Preheat the oven to 395. Slice the spaghetti squash in half and scoop out the seeds from the center. Oil or spray the inside and place the two halves face down on a deep cookie sheet or baking pan. Place in the oven. After about 10 minutes, add 1 cup of water to the pan. Let it bake for 30 minutes and remove from oven. Cool it for several minutes until the halves are easy to hold. Alternatively, if it is too hot to turn on your oven, you can cook your squash in the microwave. Scoop the “spaghetti” from the squash rinds into a large bowl. At this point, you can dress the entire batch or you can place into bowls and offer up various toppings. Romanelli’s Spaghetti sauce is really good. While not from scratch, they are a locally owned Italian deli here and I find their chunky marinara perfect over spaghetti squash. Since it’s summer, you likely have zucchini on hand. Whip up a sauce or a pesto as a topper. Try it with butter and various spices such as coriander and cumin. Want it Greek style? Top with chopped Greek oregano, crumbled feta and kalamata olives. Treat it as though it were pasta. Do you feel like nature prepares you well for the next stage? Thank you Elizabeth. The rate at which they grow takes my breath away but I’ve loved every single stage. My son is fifty years old and lives two thousand miles away – thank goodness for computer mail! No grandchildren, but I get lots of pictures of their three Dachshunds! 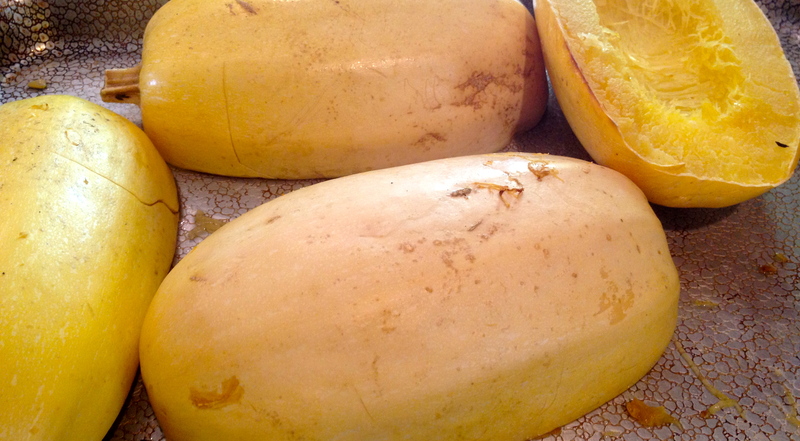 And yay for spaghetti squash – our favorite winter squash. Last year’s crop seemed not as delicious as previous years. We eat it just plain with butter and Vege-Sal. Looking forward to giving them a whirl this year. I spread it over polenta last night and it was just as delicious. This sounds great! We’ve also used zucchini thinly sliced with a mandolin instead of pasta! Oh, I did that once and forgot about it. Great idea to use up some zucchini too! I so agree–I will be an empty nester when my youngest goes to college in two years. Even though it scares me sometimes, I look at my oldest and see how she has grown and know that the transformations will occur (even if it sometimes seems in comprehensible). It’s so hard to imagine when they are tiny and I can’t believe how quickly it goes. Oh, I am so with you! I want my kids to live with me forever. I’m not sure how I’ll fill my days once they go to college. So much of what I do revolves around them. Nice post! I keep telling them that I will go with them and still make dinner at college! In two years, you may be ready to push your eldest out of the nest . . . just to see him soar. It’s easier if you know that he’ll look forward to his first home-coming. I am now in the mood for some spaghetti squash. The squash is wonderful this year Nancy! Bladen, our grandson is starting middle school this year…makes me sad, he will start as a little boy and leave a tween next spring. Time flies very fast the older I get. Middle school is the big transition, isn’t it Linda? My youngest will go there this fall also and I know from the experience of his older brothers that he will leave a young man. I love this post. I am preparing to enter this season of my life when my twin boys go away to college in less than 2 months. I’m not quite yet able to look forward to this season of my life, but I’m hopeful that, like the spaghetti sauce, the bounty of the new season will present itself to me. I think there will be some things that you love about it but that it will be bittersweet also. Yum you make me hungry and love your beautiful metaphors. Enjoy every last day with those children it passes way too fast. I have two gone and one on the way out. The first and the last are the hardest to let go. I am sure you are right. I just cannot imagine it yet though. Tammy, I have never come across the spaghetting squash here. I must keep my eyes open for it! Hmmm. I don’t recall seeing them in England, Kate. Love this post! My son is 18 and will be off in a year…and then I’ll really be an empty nester. Hard to believe how fast it happens! Isn’t it though? I feel like it was just yesterday that I was stressing over my oldest going to kindergarten. He’s still a little boy in that big manly body though. I look forward to your posts! Love reading them and love the recipes and information you provide! I’m in the same boat as you. My oldest is going into his junior year of high school, the other her freshman year. While I used to ache for them to be grown when I was a younger parent, I now find myself wishing I could slow time itself. Your kids are really similar ages to mine. My oldest and youngest match yours exactly. Fortunately, I have a little guy just heading to middle school in the fall. Beautiful post, my friend. All of life is so ephemeral. I’m not a mom, but as a doting aunt and now grandaunt, I can’t believe how quickly children grow. On my mother’s deathbed she said the happiest years of her life were when we kids (then in our 50s) were little. Enjoy those sons. And enjoy your spaghetti squash! I do enjoy them so much. I love the men that they are becoming and the boys that they are. Challenging at times but such good character! And good eaters. Oh, I would love that arrangement Charlie! I almost don’t care what the CSA provides at this point, I’m just so glad to have it back again. Though this year they’re offering plants for a winter garden. YAY!!! It is like holiday shopping each week, isn’t it? I’ve just slowed mine down for the next few weeks as I travel but already can’t wait until I crank it back up. I’ve been a lucky mom of teenagers thus far Tandy. I’m an empty nester. I miss my two children living at home, but I also like the quiet. The best of both worlds would be if they visited more often, but they lead busy lives and my daughter lives 1,500 miles away. She says she and her husband may move back to Kansas in the fall, which thrills me. They will even spend a few weeks under our roof while looking for a new home. I’m looking forward to that! They are both vegetarians, so I’ll send them this recipe and make it for myself, too! It looks fabulous, as all of your recipes do! Thanks Catherine. Perhaps you can coach me through the transition when the time comes. I am dreading it but I know there will be excitement as well as each one selects their future. Watching my grandmother age in a town without her family present has been really hard and has formed my opinions on where I want my family as I get older. Very nice to read! I’ve lived quite far away from my parents for more than 10 years now (not on purpose, but due to studies and now PhD and marriage), but the relationship with my mom hasn’t altered a bit, and with my dad it actually got easier on the distance. My mom and I talk on the phone regularly, and when I visit it’s always a wonderful time for all of us. I’ve bought a spaghetti squash once and baked it in the oven to get spaghetti, but I wasn’t very fond of it – too watery and strangely sweet. I love winter squash though, kuri the most (which is like orange kabocha) which is only in season during autumn and winter. One year I ate so much of it that I couldn’t see it anymore, but before it was in season again, I was already looking forward to it so much that I could wait for it to be harvested. It is watery and strangely sweet – perhaps that’s why I don’t add much moisture and make it so spicy. Hi Tammy, When my daughter went off to college, I felt proud and elated and somewhat liberated. My thought: I have done the work of laying a sound foundation for her. While the job of parenting is ever ongoing, it shifts in obvious, yet important ways as our children grow up. A new stage, a new cycle. Now a grandparent, I am relishing this phase so much. I hadn’t thought about it in terms of preparation from nature–but it makes sense. That gives me hope that I will be ready for it when the time comes. Interesting. I have not heard of papaya spaghetti. Is it eaten raw? Yes it’s raw, but if you like you can blanched it first…. Spaghetti squash is one of my favorite squashes. So many times I have baked it for a recipe and then decide as I pull it out of the oven to eat it right out of the skin with a bit of butter and pepper! The kids aren’t too close to leaving yet, so the empty nest thoughts do not affect me yet; but soon many of my friends will be sending their oldest to college. It is a bitter sweet time to watch the kids be so confident as they head out into the world in which we did our best to prepare them for. I love to eat it that way too Lisa. And it will be just as hard for me to watch your kids! Yep, it’s a process but it’s been the blink of an eye. Though I cannot conceive of my kids leaving the house, ever, it’s something to dream about on the days when I’m sick of tripping over their stuff and despairing that they will never learn to cook/clean/manage as adults. I greeted eggplant as an old friend this week in the CSA farm share. Surprising, really, but fun. And delicious in my uses for it! I know what you mean. I had a couple of alone days at home when my husband took the kids to California and I relished in how clean the house stayed! I feel the same way about fennel. Nature always prepares us for the next stage. Our minds though have funny ways of fooling us into believing that the stage we’re in will remain, and the next stage won’t happen. We resist, sometimes putting all our effort into it, but nature inevitably prevails and the next stage, whatever it may be, arrives. Our best way forward is to stop denying the emotion we attach to the change… recognize it, acknowledge it, deal with it, and let it go. That’s easy to say and hard to do, which is why everyone, myself included, sometimes avoids those next stages. For months we had signs that a family member was ill. Last week he passed away. My Buddhist practice helped me, but that next stage still hurt deeply. I wasn’t prepared. I had logically allowed for the possibility of his death, but had denied that possibility emotionally because the emotions were too hard to deal with. That made the reality of that next stage more difficult when it came. Nature prepares us for next stages of many kinds: life, death, emotional, physical, and otherwise. It is most helpful to everyone involved when we open our hearts to these next stages, whatever they are. Be grateful for the current stage, its joys or its lessons, and prepare your mind for joy and lessons of a new kind to come. It is easier to say than do for me. I had similar emotions this week when I went to the funeral for the Granite Mountain Hotshots. I didn’t know any of them personally but it was incredibly emotional to see those that were left behind. I truly believe that nature does prepare us in general for the stages. I have much work to do to be ready for what is next. Mine youngest two are just a bit older than yours. Fun to watch them grow. I have never thought about spaghetti squash on the grill. Do you oil it first? Yes–olive oil, a little minced garlic and rosemary, wrapped in foil. Gets a really nice smoky taste. The more simple the better…and this looks divine! There are times when I feel that way but also times when I’m happy they go out of season. Yes Kathy, there is a season. I am just enjoying this one so much that I can’t imagine another. Love this. I have to sneak in spaghetti squash eating. My husband thinks it’s vile. Hmm, maybe mix it with other stuff because I think it would be sort of hard to hide? Kids grwoing up too fast freaks me out a lot although mine is just 7 years old. I feel like he is gonna be taller than me any moment now. And oh I wish we had spaghetti squash in India! It goes faster than you can ever imagine Tes! Good to hear from you.